"My mother was brought up in Duddingston Village, where they lived above the Sheep's Heid. Like my father, she left school at 13, so what was that about? She told me that when she was young, one of her aunts would visit on the same day each week. She would be sent to the baker's for a box of cakes for afternoon tea. The baker's was in Portobello, and there were no buses in these days. I hope someone can tell me what happened with the schools then." I've just checked the Wikipedia page on the internet.  - Education finally became compulsory for all children aged between 5 and 13 with the Education (Scotland) Act 1872. - The leaving age was raised to 14 in 1883. However, the evidence from the answers below seems to suggest that for many years after 1883, pupils were leaving school well before age 14. "I’m not sure when Lyndsay’s mother was born – but my dad was born in 1912 and left Bruntsfield Primary School at the age of 12, without going to secondary school. In the late 1940s, I remember the school leaving age was 14 and can remember it going to 15 probably in the early 1950s. I’m sure there are records around somewhere"
"The school leaving age used to be 14 years old. I thought it was 13 years old in 1914 as they got the wee laddies to sweep the lums (chimneys)." "I hope this may be of interest. 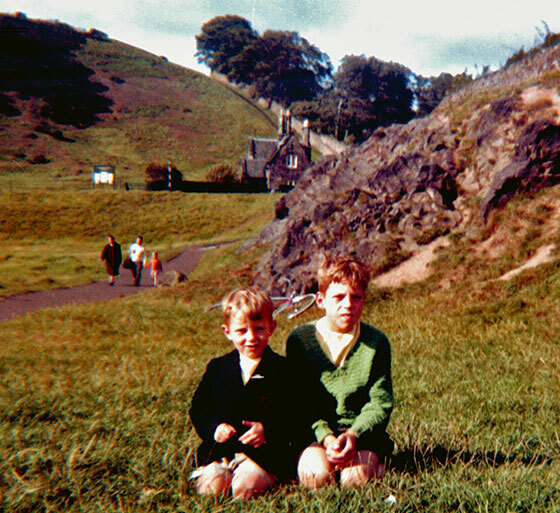 it's a photo of my brother, Charlie, and me at Duddingston, close to Duddingston Loch. We were exploring the area after moving from Moredun prefabs to Lady Nairne Avenue. The photo was taken looking towards the Park Warden's House. That's in the same direction as the photo of the Raeburn boys was taken. The boundary wall and the trees on the right of the photo are beside a long flight of stairs. Duddingston was a great place to go for a picnic of jam pieces and home-made liquorice flavoured water, which never caught on with the fizzy pop giants!." "My grandmother Elizabeth Sinclair was born in the last stone cottage on the left as you go down the lane at Duddingston Mills. - her mother and father were Annabelle and William. - her brothers were Jack, Harry, Hugh, Alan and Robbie. - her sisters were Lena and Nina. - an Anderson shelter in the garden. My grandmother's neighbour Mr Cochrane kept a number of hens in his back garden." - Peter Wood. He was foreman at the Blacksmiths. - Mrs Wood and her daughter Bessie, Annie Boyd. - Jim and Molly Learmouth. "My Grandmother attended the wee school in Duddingston. - Miss Spalding was the Headmistress. She left in 1945 to become Head Teacher at Juniper Green Primary. - Miss Henderson was the infant school teacher. - Mrs Mary Jones came up from Portobello (after Miss Spalding left) to be Janitor and live in the schoolhouse. She was known as the 'Queen of Hearts' as she followed the Hearts all over Scotland. (Football was her life!) My grandmother recalled having picnics on her lawn." "Elizabeth's father, William, was a Carter and Lorryman at the mill during this period. The house was tied to the job as all the cottages were built for the families of the men who worked at the mill. The mill stopped working in 1950. William worked six days a week, three days in the mill making flour and three days delivering the bagged flour to Musselburgh and beyond. The grain for the flour came from Southfield Farm and Meadowfield Farm and the harvest was taken to the mill. William was from Duns, Berwickshire, and his wife Annie was from Pathhead. Annie cleaned the office of the mill when William was unable to work through ill health for about 15 years. She was paid in lieu of rent for the tied house. My grandmother recalls that she and her brothers and sisters were never allowed near the Mill lade. She remembers how crystal clear the water was going into the Mill." Thank you to Iain Brennan for replying to Dave Meacher's Recollections 2 above. "I lived in Portobello from 1957 to 1965. During that time, I attended Duddingston Primary School 1957- 62, then Portobello Secondary 1962-65". "I knocked about with a couple of school pals who lived in the Village of Duddingston, so I know the Park area well,. The steps that Dave Meacher mentions in his recollections were steep and many. I've climbed them many a time in my youth. "While the use of the Pig Bins was effectively a form of recycling, my recollection of the reason for their existence was that they were a wartime measure that ran in parallel with the 'Dig For Victory Campaign', the purpose being to provide food for pigs using domestic waste rather than using more valuable sources of food in the face of 'The U Boat Campaign'. We were unlucky enough to be 'blessed' with one of the bins being sited on the pavement outside our house and boy did they stink in hot weather." "Southfield Farm, Duddingston, was at the top of our street and they kept some enormous pigs there. The pig swill was boiled up presumably to kill off any nasties and transported to the sty in a large wheeled sort of bath shaped container. My memory may be wrong but I seem to remember that at some stage, the street 'pig bins' were removed and every house was issued with a small lidded container like a large pail for pig waste, but that system only lasted for a few years. 'As was stated by another contributor back in the 1940s and 1950s, nearly all houses were heated by coal fires, meaning that bins (we called them buckets in those days and the men who emptied the were called bucketmen) contained mostly ashes form the fires and the odd tin. I can't remember what sort of vehicle the Council used for the collection of the 'pig waste' but the normal bucket collecting vehicles were rather primitive compared with today's massive vehicles. The Council vehicles consisted of what might be termed a long 2-wheeled-roofed-van with a row of 3 or maybe 4 roller shuttered openings along each side. It was towed by an open tractor which, compared to a farm tractor, was much lower to the ground. The bucketmen physically emptied the buckets into one of the roller shuttered openings. I've never seen a photo of these vehicles and would be interested to see one." "Recycling is far from being a new thing. In, I think, the late- 1940s or early-1950's, there was a separate collection of waste paper and cardboard known at the tine as 'The Salvage Collection'. At one point, the government passed legislation threatening massive fines for anybody caught burning paper. A novel feature of 'The Salvage Collection' system was the use of, as I recall, Electric Vehicles. The refuse collection vehicles were painted a sort of olive to light green colour. - the vehicles used by Edinburgh's bucketmen? If you'd like to reply to Gus (perhaps because you know of photos the vehicles used by the bucketmen or photos of Southfield Farm) please email me to let me know, then I'll pass on his email address to you. 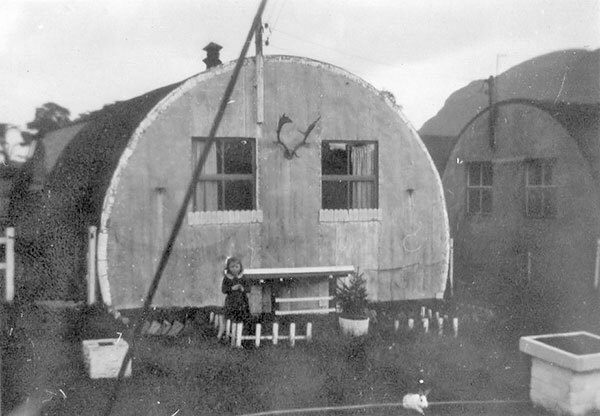 Thank you to Anne for telling me about the time when she lived in a hut at Duddingston Camp, one of the camps in Edinburgh occupied by returning soldiers and others and their families during the housing shortages after the end of World War II. Anne was born in March 1947 and lived at Duddingston until around 1954/55 when she moved with her family to a prefab in Ferniehill, Edinburgh, which she describes as: "Pure luxury compared to the camp!". 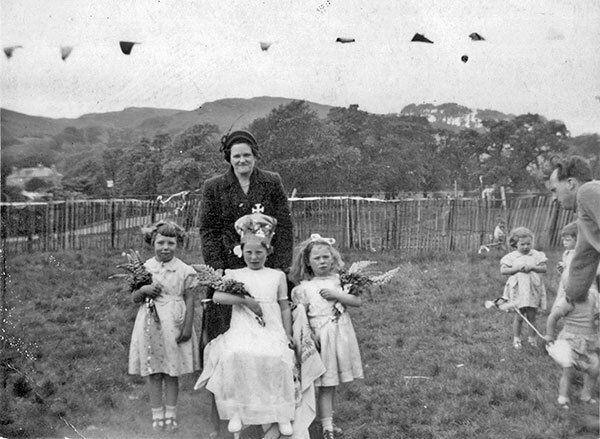 "This photo was taken on Gala Day, possibly celebrating the Queen's Coronation in June 1953." 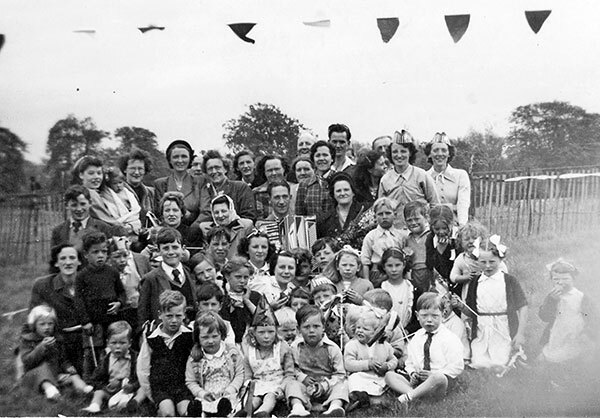 "This photo is of a mock coronation at the camp in 1953. A committee was set up and my father, being very good at fretwork, made the crown. I was one of the two Ladies in Waiting. I'm on the Queen's left and was 6 years old. The other lady in waiting, I think, was called Betty." "Here is the back of our Hut, No. 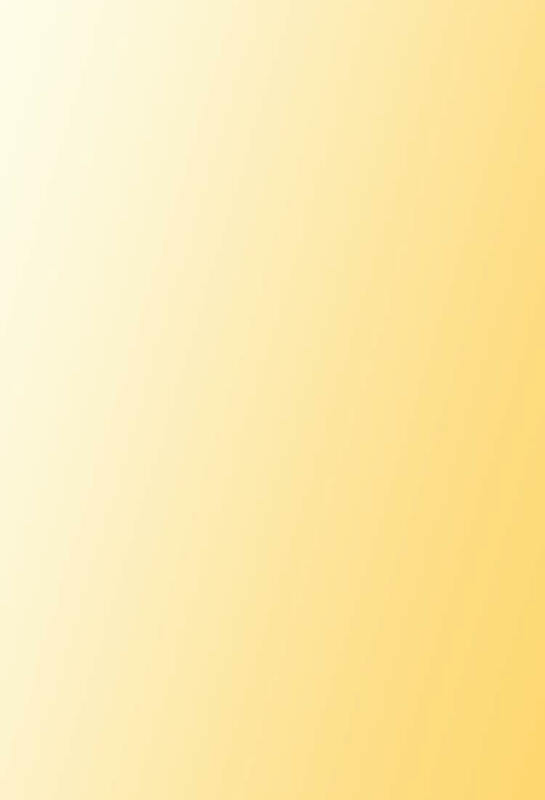 221. 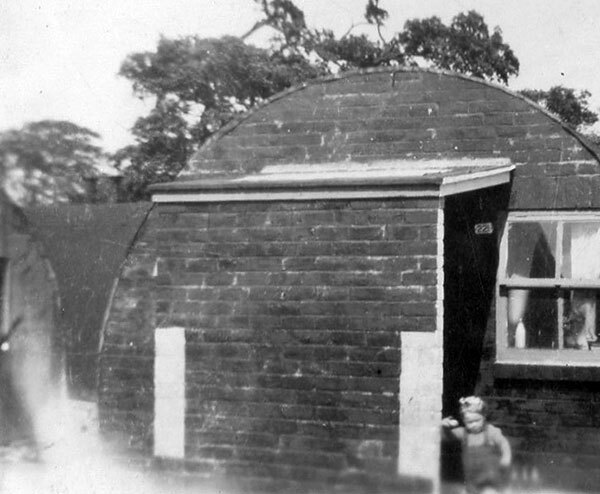 Dad once told me we had an Officer's hut, so it was bigger than others. I am the little girl in this photo. - We only had a round black metal stove. - There were communal kitchens and shower blocks. - It was all very primitive, but it was all that was available when Dad came back from the war."  "Here is a a photo of the front of our hut, No. 221, at Duddingston Camp. I am the little girl at the front of this photo. The photo would have been taken around the late-1940s.